Supreme Adhesives Miter Blend is a innovative (Translucent) fast cure adhesive for granite, marble, and quartz . It is engineered to withstand the pressures of CNC and Automatic Edge Machines. Can be colored with polyester coloring pigments to match the color of the stone, before adding hardener. When it comes to translucent fast cure adhesives, Miter Blend has no equal. Granite, Marble and Quartz adhesive. Mix with 1%-3% Paste Hardener (included). 1.25 Gallon Can with Paste Hardener included. Supreme Adhesives MAXXIMO Poly-Epoxy Adhesive high quality blend of polyester an epoxy that gives the strength of an epoxy with the speed and ease of a polyester adhesive making it a high quality hybrid adhesive. MAXXIMO Poly-Epoxy Adhesive is very light in color and is great for lamination, seams, and joints. Supreme Adhesives MAXXIMO Poly-Epoxy Adhesive is a premium quality 100% vinyl ester adhesive. It has been designed with the stone fabricator in mind. MAXXIMO Poly-Epoxy has been engineered to have the best possible ratio of working time to curing speed with increased bonding strength compared to standard polyester adhesives. Uses include bonding, laminating, installation of pieces and stone repairs. Save on shipping with our 5 Gallon Ship Saver: 4 - 1.25 Gallon Cans Super fast. Clean cut. Diamond side protection. Wet & Dry use. 5 Gallon Ship Saver: 4 - 1.25 Gallon Cans with Paste Hardener included. 5 Gallon Bucket with Paste Hardener included. 1 Quart Can with Paste Hardener included. 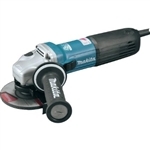 The Makita 4-1/2" SJSII High Power Angle Grinder (GA4542C) combines power, convenience, comfort and motor-protection features for longer-lasting industrial performance. It is ideal for cutting, grinding ferrous metal, paint and rust removal, shipyard maintenance, metal polishing, general steel grinding, auto repair work, cutting brick and masonry, restoration work and more. Abaco 100 Stone Vacuum Lifter (model SVL100) is the biggest lifter in this family and has 4 Vacuum Cups for superior lifting of heavier slabs. The minimum slab dimensions are 52" x 28-3/8". This lifter also has an inclination between 0°-90°. The maximum safe lifting capacity is at 2,200 Lbs. It features robust construction with the ability to lift and to tilt the stone slab. Abaco 100 Stone Vacuum Lifter Stone Lifters require just 11 PSI (0.7 - 0.8 Bars). Therefore, most compressors on the market today, should be enough to operate with these lifters. No need for a generator. Maintaining Pressure of Pre-Vacuum Tank Bar (kg/cm2) .07-.08. Warning: For all Abaco lifting products, follow the manufacturer's specifications for minimum slab size and Working Load Capacity when choosing the appropriate lifter. When using an Abaco lifting product, follow all safety instructions and processes found in the product's manual. The new Zenesis Black bridge saw blades are the newest innovation to the world's most advanced patterned diamond technology. The new style segments provide the life you expect from a Zenesis with an approximately 20% increase in cutting speed over the Zenesis II. These blades are available in 12", 14", 16", 18" and 20" sizes. All these blades have large 25 mm segments and a 50/60 mm arbor.